Today’s excerpt from the Field Guide to Urban Industrial canals is on the ecology of transportation. For earlier posts on canal ecologies see here, and to see or download the whole guide see here. Transportation in American cities is supposedly all about the car. The automobile dominates our perception on the street- horns honking, engines humming, brakes squealing- but it is not so important in the history of industrial canals. Canals had their heyday in the mid-1800’s, well before the Model T got rolling. While some canals initially had the jump on the railroads and so were used to span great distances such as the Chesapeake and Ohio Canal, or most famously the Eerie Canal, the majority were quickly turned into a complimentary component of a sophisticated mash-up of an industrial transportation system made up of local roads, docks, and regional rail roads. In fact, two of our examples- the River Rouge and the Riacheulo- continue to function today in just such a capacity. In the case of the River Rouge, the canal is now surrounded by bands of regional highways and railroads. Zug Island, located right at the mouth where the canalized River Rouge meets the larger Detroit River, is traversed by a major rail line and accessed by a single road. The island was once a marshy peninsula on the edge of town unfit for settlement. A new channel was cut through to create a straighter shipping route, and Zug Island was the byproduct. It was purchased and reconstructed as a giant landscape factory for steel production and now receives loads of coal via dock to refine into coke for the steel-making operations which then gets shipped out via rail line. However, the rest of the canal is ribboned with the freeways and highways that serve the number one export of the car capital of the twentieth century. 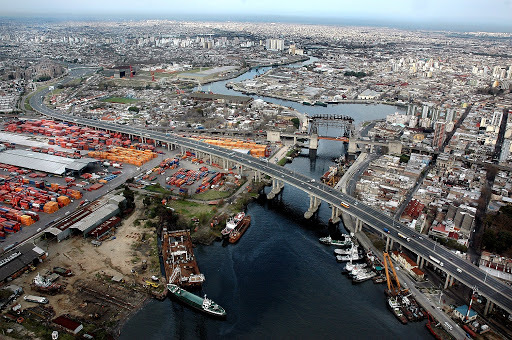 In Buenos Aires the Canal Sarandi serves the main receiving docks of the petrochemical port as a spur off of the Riachuelo River. This area of town is a prime location for the port because of the canal and its proximity to the railroad and Autopista al Sur which connects to the rest of the country without having to cut across the central city. 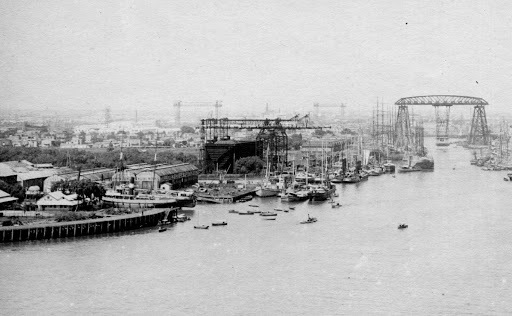 A hundred and fifty years ago when the canal was first being constructed the port was on the southern edge of the city, a fortuitous occurrence that kept the industrial factories and pollution segregated from the city proper. As the city population grew from 1 million in 1850 to 13 million in 2000 the city reoriented itself around the river and the port, drawn by the cheaper lands to the south and the economic engine of the port and its concomitant industries. This southern part of Buenos Aires has grown up around the freeways and railways that serve the port, the local municipal grids filling in around the lines of infrastructure, sometimes in an unplanned ad hoc way. The freight rails, passenger trains, and commercial highways, and local street grids that are brought together at the industrial canals is a pattern that holds even for canals that are no longer used. The abandoned canals, with their large vacant tracts and adjacent industrial zones were prime candidates for interstate freeways when the great highway projects of the 50’s and 60’s came through. The effect today can be a wall of sound, especially in the evening as cars pour out of the city and into the suburbs. But this wall is different than being in the rush hour traffic on Broadway. The difference is due to an effect of displacement that occurs when one is along an old industrial canal. And this displacement effect can be one of the special aspects of a canal. While canals in the city have historically attracted the great, hulking commercial infrastructures of transportation such rails and highways, they have simultaneously severed the local municipal street grid- the roads, the bus routes, and the sidewalk end here. As a result the local traffic is usually at a minimum, while the commercial and regional traffic is loud and at a distance. The effect can be magical- a quiet forgotten place in the city with privileged access to the great humming and rumblings of the modern city. In Brooklyn the Gowanus Canal maintains just this attraction. It is a sublime landscape with the old ruined factories and rubble heaps and scrap yards interspersed among garages and warehouses. The F/G trains and the Gowanus Expressway cross overhead and at night the little lights in the subway cars are beautiful. If you go there on the right night and watch the subway crawl along the tracks and see the distant skyline of Brooklyn and Manhattan, if you notice the bats diving for insects against the dark silhouettes of the strange warehouses and factories around you will feel that New York City is the place for you; that despite our propensity for creating ugliness, beauty is bigger than us. When I first read this The abandoned canals, with their large vacant tracts and adjacent industrial zones were prime candidates for interstate freeways when the great highway projects of the 50’s and 60’s came through. The effect today can be a wall of sound, especially in the evening as cars pour out of the city and into the suburbs. I mistakenly read it to mean that the old no longer used for industry, canals were dried out and the canal-beds used to house new interstates.. But i don't think that is what you were saying. That would be an interesting but certainly not the best use of these sites though. As below grade transit corridors? Although I suppose you could deck it then? Ooh, good point. that is a bit confusing.You're right, they usually aren't used as the actual road, but their right of way is usually appropriated at several junctures by interstate systems. The notion of retrofitting canals as below grade transit corridors is interesting though. especially a transit corridor that could take advantage of the hydrological patterns and water, instead of fighting it. Repurposing canals for water taxi systems would be promising in certain cities, like NYC.